Once I working in a home building, I always remind our workers not to forget the electrical conduit within concrete. That will play an important roll later in the home building process. I have seen too many times the workers forgot to arrange the electrical conduits before concrete. If you determine add electrical conduits on the concrete. That you should contact your electrician, before you pour the concrete and make sure that they don’t need to run anything, in your concrete foundation slab. If the electrical contractor says that he can’t think of anything, that might not be a good sign. Try to get them out to the job and go over the project together. Once the concrete is poured, there won’t be any turning back and any repairs will require a lot of work and no matter how they are repaired, the structural strength of the new concrete slab will never be the same. Some of the biggest problems that I have found over the years have been, when a kitchen island is going to be installed and this area will require electricity. If the home builder is going to install a stove, oven, dishwasher or any electrical outlets and switches, make sure that you have the proper sized electrical conduit that will be required, for the amount of wires that you are going to use. 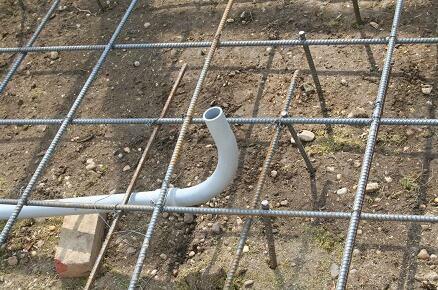 If the electrical conduit was small, it is hard to through the wire and cables in it. So before choose the conduit size, please make sure the conduit sizes are bigger than the cables. It wouldn’t be a bad idea, to contact another person with building experience, to check your electrical plan, before pouring the concrete slab. Sometimes two minds work a little better than one.